1. Real estate –Sale and lease. 2. Lease of retail outlets. 3. Joint ventures with developers. 4. Leasing and sale of entire properties with High Value clients. /Builders/Investors/Private equity /Venture capital /Foreign Direct Investors. 5. Franchising in retail and other spheres. 6. Arranging attractive investment proposals/ideas for investors. 7. Holding real estate/franchising /retailing /financing expositions and exhibitions in all towns and cities. 8. Finding investors for local developers and Builders. 9. Underwriting entire projects for marketing, investments and execution. Address: No 1,Gandhi Street, back side of Indian Oil Petrol Bunk, Kumaran Nagar, Semmencherry,, Sholingnallur, Chennai, Tamil Nadu, India. 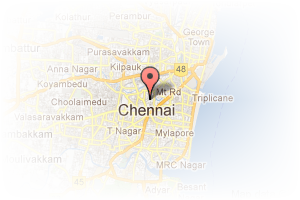 This Broker Profile page for "Shri Janani Homes" has been created by PropertyWala.com. 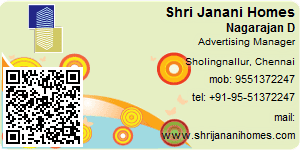 "Shri Janani Homes" is not endorsed by or affiliated with PropertyWala.com. For questions regarding Broker Profiles on PropertyWala.com please contact us.